It takes superhuman ambition and supersize resources to challenge the likes of Amazon.com and Costco Wholesale Corporation. 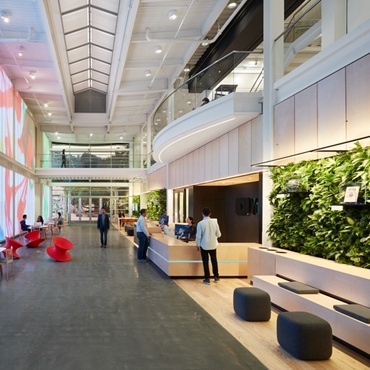 So why not a superhero-inspired workplace? When Jet.com was still based at an incubator, the e-commerce start-up gave the names of different superheroes to the company’s various teams. 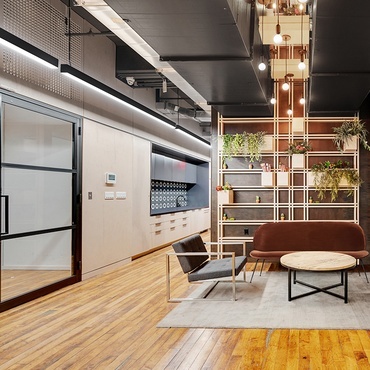 “That would be something good to keep,” Interior Architects principal and design director Julio Braga said to himself when conceiving the company’s first real headquarters, in a new building on the Hudson River in Hoboken, New Jersey. Although the company had outgrown the incubator, IA intermediate designer Brie Samyn notes, “They liked the buzz of everyone being together.” That meant constantly moving through a vibrant environment. 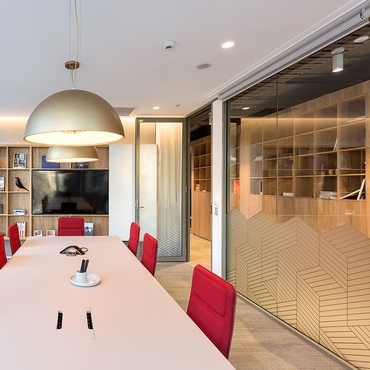 Braga and Samyn therefore settled on a largely open plan, with office areas occupying the four corners of the 40,000-square-foot floor plate. Of the 350 employees now, about 200 work in a dedicated team, while the remainder either float among unassigned desks or have no desks at all. “The CEO, the employees—you see everyone,” Braga says. Tucked between these quadrants are shared spaces, from the reception area to a variety of meeting venues. Then there’s the question of branding. Samyn explains it as “making sure, when you walk in, that the headquarters can’t be mistaken for that of any other company but accomplishing that without a big gesture.” The winking letter J in the purple logo gave her and Braga the idea to develop what they refer to as “Jet wink moments,” subtly clever references. Because Jet.com is an e-commerce company, one inspiration was shipping materials. Evocative of pallets and crates, redwood forms the canopy above the elevator lobby. It’s also crisscrossed by a painted band—“kind of like packing tape,” Samyn says—that assists way-finding toward the reception area. The paint is purple, of course. A wall in reception is covered in pressed-paper panels corrugated to suggest the lining of a cardboard box. “They also have a kind of draping quality,” Braga observes. The desk’s faceted front references the Jet.com graphic banner, with its upturned corner. Meanwhile, the major exception to the “wink” approach is the huge, glowing purple LED signage. It’s attached to the back of bleachers sitting between reception and the pantry. Fitted with wheels that follow tracks in the floor, the bleachers can slide apart for large events, fill­ing both spaces. The two are unified visually by a gridded wooden canopy. “For the pattern, we looked at the sides of shopping carts,” Samyn says. The bleachers can slide back together again when, for example, a small group gathers in the pantry for happy hour or to watch a soccer match. Even with the bleachers in closed mode, their backs in perforated galvanized steel allow anyone seated in reception to see through to the expanse of windows framing that fabled Gotham skyline. An abstracted cartoon trope of good versus evil plays out overhead, with the ceiling painted white in the reception-pantry zone, beyond the canopy, and black in the office areas. Delivering more explicitly on the super­hero concept, the “huddle rooms” for meetings are named for such comic-strip locales as Clark Kent’s Daily Planet and Mole Man’s Monster Isle. 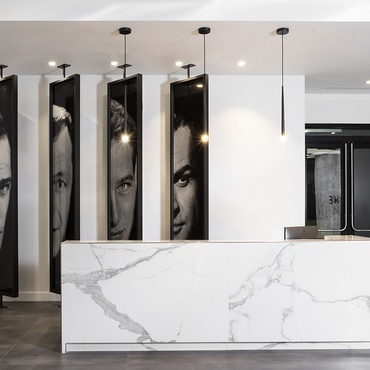 The library, which can transform into a boardroom that accommodates 40-plus, features photomural portraits of Hoboken’s own hometown superhero, Frank Sinatra, the self-styled Chairman of the Board. 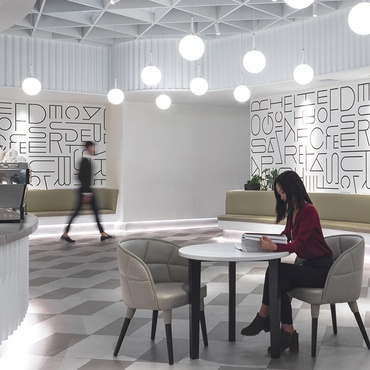 Completely in the open, among the workstations, painted circles on the concrete floor demarcate break-out areas furnished with tables and ottomans. When the need for quiet or privacy arises, glass-fronted phone rooms are available. They’re nestled next to alcoves containing upholstered banquettes and shell chairs by Charles and Ray Eames. 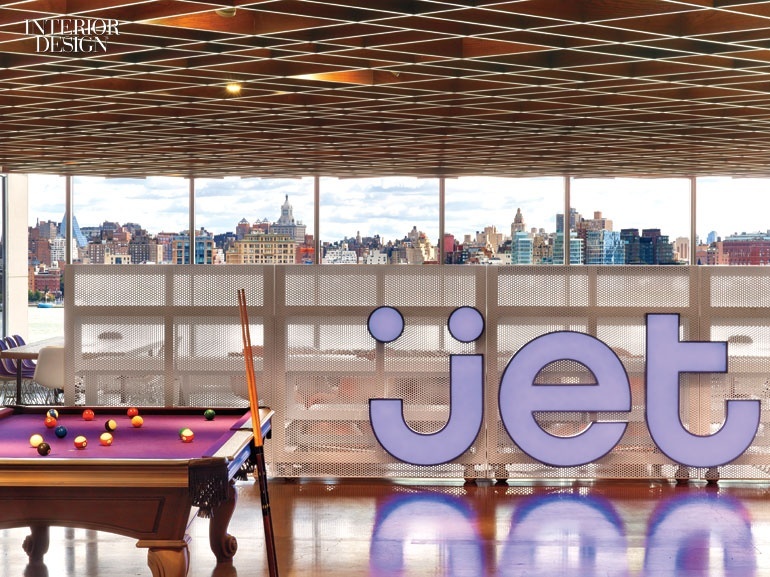 All that still isn’t sufficient for fast-growing Jet.com. The company has leased the level below, expecting to expand there next year, and IA is once more coming to the rescue on the design front. As a way of thanking the customers behind the success story, the names of the first 25,000 to test the Web site, in beta, are listed on a purple wall as Jet Insiders. From the company’s perspective, they are the true heroes, one and all. 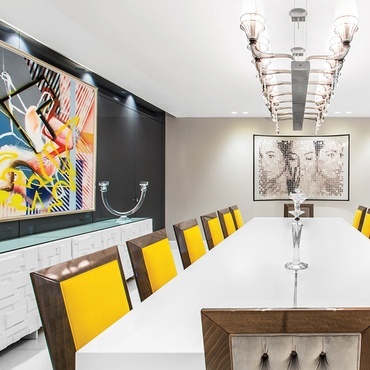 Project Team: Stephen Furnstahl; Erik Hodgetts; Ali Ucer; Eden Anto; Lourdes Saladino; Shih Hua Liong: Interior Architects. Lighting Workshop: Lighting Consultant. Mirror NYC: Graphics Consultant. Acoustic Distinctions: Acoustical Consultant. Electrosonic: Audiovisual Consultant. GACE Consulting Engineers: Structural Engineer. AMA Consulting Engineers: MEP. 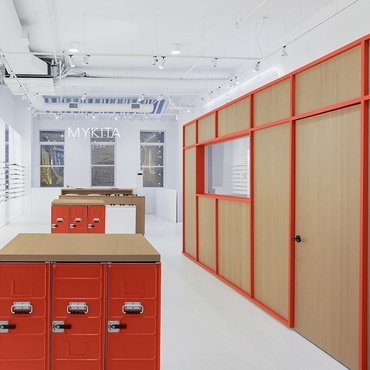 Corporate Woodworking: Woodwork, Metalwork. Coyle & Company: Signage Workshop. Throughout: Johnsonite: Base. 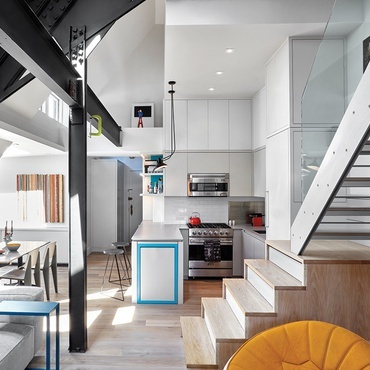 Benjamin Moore & Co.; Scuffmaster: Paint.